Fry the bacon in a medium saucepan over medium-high heat until done. Add the mushrooms and cook until soft, about 3-4 minutes. 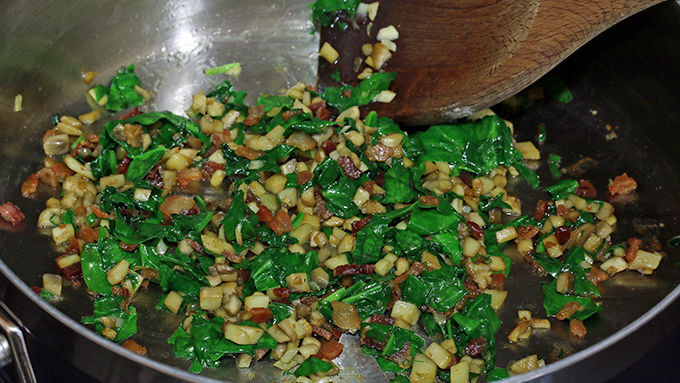 Add the spinach and garlic and cook for just a minute or two, until the spinach is wilted. Place the mixture in a bowl and let it cool down. 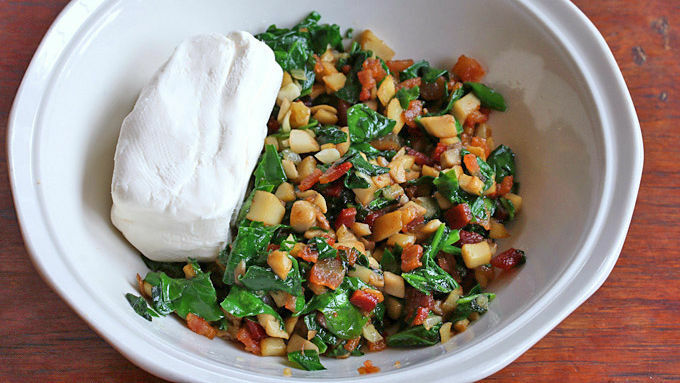 Add the goat or cream cheese and stir to combine. Place about 1 teaspoon of the mixture in the center of each wonton. Use your finger to wet the rims of each wonton (to help seal them) and gather up each side like a parcel, gently pressing to seal the dough together. Or prepare them in any shape you prefer. Pour the oil in a small saucepan to about 2 inches high. Heat the oil to roughly 375°F. 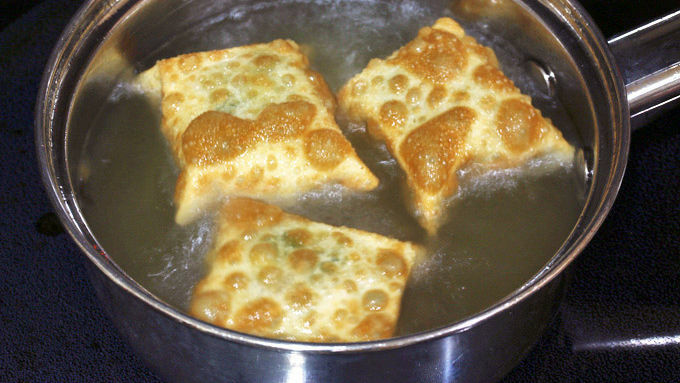 Place a few wontons in the hot oil and fry until golden brown, turning over halfway into it. Place the fried wontons on a plate lined with paper towels and keep warm in the oven. Repeat the process with the remaining wontons. Serve with a sweet-spicy Asian chili sauce (or your favorite sauce). 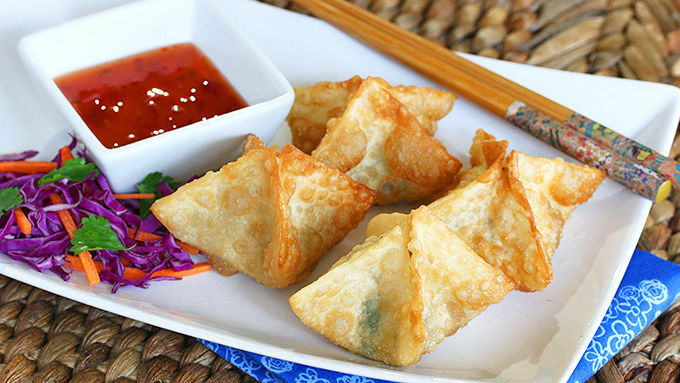 These wontons should really come with a warning label – because they’re dangerous. Once you’ve popped one into your mouth you won’t be able to stop. 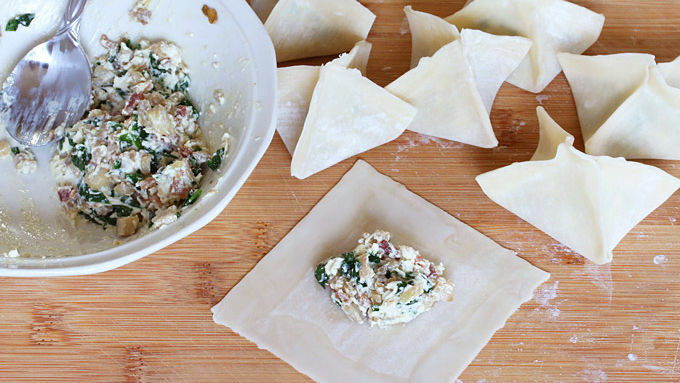 The crispy wontons shells filled with the flavors of tangy cheese, savory bacon, mushrooms and spinach are insanely good. Just wait until you’ve experienced the sensation of crunching down on these crispy wontons and letting all those flavors penetrate your taste buds – it’s heaven! The filling can be prepared in advance and then assembled just before you’re ready to fry them. You can use either a deep fryer or use a small skillet. For those of you who don’t own a deep fryer, I’m going to demonstrate these using the skillet method. We’re going to serve these wontons with some standard Asian sweet-hot chili sauce but you can use any dipping sauce of your choice or... none at all. The flavor of these wontons is so incredible that I actually prefer eating them plain without any other competing flavors. Serve with your favorite dipping sauce (e.g. Asian sweet-chili sauce), or without, and enjoy!